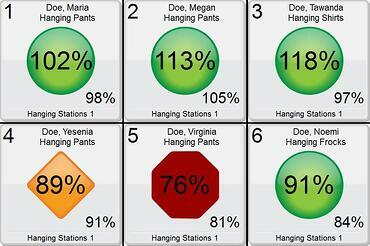 Without a visual workplace in your commercial laundry operation, your employees are missing their scoreboard. This leaves them unclear of their performance (score), efficiency (time-clock), and unsure of their standing (bracket) in the company. Without a scorecard it also makes it very hard for managers to provide timely feedback and coaching. Spindle's visual workplace captures employee performance in real-time and displays performance as productivity alerts using easy to interpret shapes. The green light indicates that an employee is at or above the target, while the red light indicates that they're below the target. Employees can compete with themselves by trying to beat their personal best, and they can motivate their peers by competing with them throughout the day. In both cases they're improving performance because they're tracking their score throughout the day. The best college basketball coaches earn millions of dollars because they consistently develop players by providing timely and constructive feedback. Many managers are uncomfortable addressing performance issues, but a HBR study revealed that 57% of respondents prefer to receive 'corrective feedback' as opposed to praise. Further, 72% of respondents felt their performance would improve if they received this 'corrective feedback'. This study makes it clear that not only do employees want feedback, but they want to hear the feedback that will help them improve! Up until recently it has been impossible to provide timely feedback to all employees. Performance was tracked with a stopwatch and a notebook for a few employee or a single process. It was then written on a whiteboard which was often far enough away that employees couldn't read it from their work area. By the time employees received any feedback it was too late to adjust and they had probably forgotten what they had been doing. Real-time performance tracking is now an automated standard at commercial laundry plants throughout the world. All employees can see how they're doing by looking up at their scorecard and managers can view the performance of all employees in real-time. Managers can spend their time coaching and employees are responding with profound results. Commercial laundry plants are at their best when the employees know what is expected of them at the start of the day and if they accomplished their goal at the end of the day. Providing this feedback to employees can be a reality now. Like this article? Subscribe to our blog and receive the latest news in Commercial Laundry Innovation!